After winning the Sports Car Club of B.C. Formula Continental Championship in 2016, SCCBC member Mitch Egner of West Kelowna set his sights south of the border to take on the 2017 Pacific F2000 series with a six weekend, 12 race series at Auto Club Speedway, Willow Springs Raceway, Buttonwillow Raceway and the world-famous Mazda Raceway Laguna Seca, all in California. After a rough first weekend at Auto Club Speedway where he lost two engines in as many days, managing only one point from the whole weekend, Mitch came back with a vengeance at the second race weekend at Willow Springs where he took home wins in races 3 and 4 over Downey, California’s Tom Hope. A new unsorted aero package led to disappointing fourth and second place finishes in races 5 and 6 at Buttonwillow Raceway behind race winners Tom Hope and Tim De Silva. The fourth weekend of the series moved to Mazda Raceway Laguna Seca in Monterey, California. 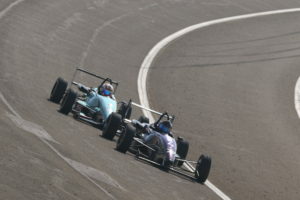 After race-long battles with Tim De Silva, Mitch came away with second place finishes in races 7 and 8. After a month’s respite, the fifth race weekend saw a return to Mazda Raceway Laguna Seca, leaving Mitch the team with time for some serious developmental work. The weekend would prove to be the turning point in the season as Mitch posted the fastest times in each and every session, proving untouchable in both races 9 and 10. With the two race wins from Laguna Seca, Mitch took the points lead, finally recovering from the devastating early season engine failures. With good finishes at the final rounds at Auto Club Speedway in October, Mitch knew he had a good chance to take home the championship title. Placing second in both races 11 and 12, he came home with his first Pacific F2000 Championship title, 24 points ahead of Tom Hope, who finished a single point ahead of third place finisher Tim De Silva. 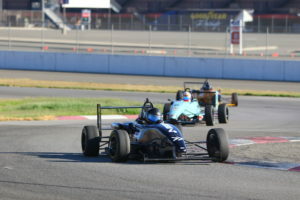 This season the Pacific F2000 Championship series is included in the Mazda Road to Indy USF2000 Scholarship Shootout. The winner of the knockout-style shootout will be awarded with a $200,000 Mazda Scholarship to enter the Cooper Tires USF2000 Championship Powered by Mazda in 2018 – the first rung in the Mazda Road to Indy ladder, sanctioned by INDYCAR. Our warmest congratulations to Mitch from everyone at SCCBC. Good luck in 2018!